Are you looking for the Tech Mahindra Off Campus 2018-2019 Drive? then here is the great opportunity for you guys to exhibit your skillset. There are multiple vacancies in Tech Mahindra. Consequently, Tech Mahindra is now hiring a huge number of people fresher candidates, all 2018, 2019 passed out candidates. Equally, postgraduates can also apply for this job. So, check this page without delay. To apply this job you need to meet the eligibility criteria given below. Those who are eligible for this Off Campus Drive can now apply for this job. Getting a job in Tech Mahindra is a great thing. Candidates who clear their academic subjects during their graduation are eligible for this Tech Mahindra Off Campus 2018-2019 Drive. Registrations would remain open till 24th March 2019. Aspirants passing out in 2019 and meeting the criteria also stand eligible. Not more than 1-year gap since SSC and that too not after joining a course. Means, no loss of the academic year after joining a course. Candidates shortlisted from the registered list will be called for Aptitude Test, English Essay/Story, Technical and HR Interview with each of these acting as a filter for the next stage on the selection process. NOTE: During probation, candidate will undergo unit specific classroom training / on-the-job-training / shadowing / all as per the business requirement. Candidate should be willing to work at any of the TechM Development Center’s or Client Locations spread across the country as per the company specified work timings including shift working. Anand Mahindra (Chairman & Founder), Vineet Nayyar (VC) and CP Gurnani (CEO) who stood as pillars and the main reasons for the growth of the Tech Mahindra family. The services provided in Tech Mahindra are outsourcing. It also provides Business Process Outsourcing(BPO) for Telecom Industries. Its Registration office is situated in Mumbai. Therefore, Tech Mahindra is one of the fabulous 50 companies across India. The Tech Mahindra was ranked Top 5 Industries in 2012. Tech Mahindra had embarked on an exciting journey with Robotics Process Automation. Future in Tech Mahindra, Virtualizing the Radio Access Network (RAN) is one of the most important network transformations. Therefore, Tech Mahindra has been standing upon the competition in the current world. Tech Mahindra is one of the biggest telecom services across India. Tech Mahindra helps to improve outbox thinking and skill sets. It encourages our internal skills and helps in our career growth. The candidates who are working for Tech Mahindra are successful out comers. B.E, BTech in Computer Science & Engineering, Information Technology, Electrical Engineering, Electronics & Communication Engineering, Mechanical Engineering, Electronics & Telecomm Engineering etc. Individuals who had completed the full-time course without backlogs are eligible for this job. B.A, B.Sc, MCA, MTech with CS and IT are eligible for this job role. Aspirants should have good communication skills. Equally, should be willing to do both day shifts and night shifts. The candidate should be 18-28 years old. In order to attain this job, the aspirant should be good at coding skills. The candidate should clear the written test. Contender should be good at arthimatic and logical skills. Aspirants should have 60% in 10th standard, Intermediate, Graduation and Post Graduation to apply for Tech Mahindra Off Campus 2018-2019 Drive. No Backlogs are allowed. In the case of backlogs, the aspirant should clear them before joining the company. Candidates who are eligible for the marks criteria can apply for this job. In order to apply for this job click on the link below. It is mandatory for every individual to clear their backlogs before joining the company. At the same time, there are four rounds to clear this interview whose description is given below. The total time allotted for the written test is 50 minutes. There is no sectional time limit. In general, every individual has to check the official site of Tech Mahindra. Therefore, the contenders who want to participate in the Tech Mahindra Off Campus can read our whole article to know whether you are eligible are not. Before applying for the Tech Mahindra Off Campus 2018-2019 make sure that you are a qualified candidate. And check the test pattern, salary, requirement, job role, location etc. Id Proof (Adhaar Card, Pan Card, Id card, Passport etc). Candidates those meet the eligibility criteria can now attend the interview by taking the important certificates described below. Every individual needs to check the eligibility criteria and apply for the job. In order to clear the interview, the candidates should know the each and every round thoroughly and should practice well in order to crack the interview. Already registered candidates can now log in and track their application status. Therefore, the interested candidates can now register for the Tech Mahindra Off Campus 2018-2019 by clicking the below and can test your careers. As the competition is tough every individual needs to work hard to attain a software job. 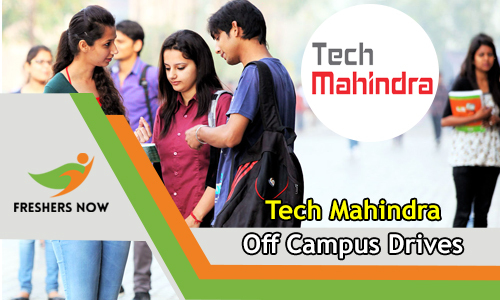 If you are eligible for Tech Mahindra Off Campus 2018-2019 Drive you can check out the link below. Now, you can apply for the Tech Mahindra Off Campus 2018-2019 Drive by the following process given below. Visit the official web portal of Rech Mahindra @ www.techmahindra.com. Find your career growth by applying to Tech Mahindra Off Campus 2018-2019 through Online Registration. We hope that you have got useful information. If you meet the eligibility criteria you can apply for this job by clicking the link given above. So, job seekers keep on browsing our website www.freshersnow.com.